Fresh beets seem to be experiencing a renaissance, or at my house they are since joining a CSA several years ago. 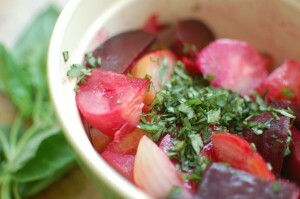 I admit, growing up I enjoyed canned beets on salads, and had never cooked fresh beets until recent years. Beets are like a bonus of two vegetables — the leafy greens to quickly saute with olive oil (garlic optional) for a side dish, and the beet root to steam, roast or serve raw. Beet roots have an earthy-sweet flavor and a satisfying texture that is firm yet buttery when cooked. Or grate them raw for a crunchy addition to salads, just don’t mind the bright red color they add! 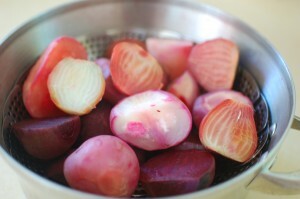 Of course, golden beets have a less colorful affect, as do the light pink variagated Chioga beets. Peel beets if desired. Halve or quarter and place in a steamer basket. Add water up to the bottom of the basket. Cover and simmer until beets are tender-crisp, 20-30 minutes depending on the size of the beets. Test with a toothpick or tip of a knife until it inserts with slight resistance. Remove the beets to a plate to cool. Slice a generous amount of fresh basil leaves into ‘chiffonade’ which is the French culinary term that literally means rags, but refers to strips or shreds of vegetables. 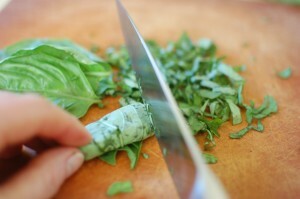 Here’s how: Stack several basil leaves, tightly roll, then slice crosswise with a sharp knife. If smaller pieces are desired, roughly cut the strips again a few times. Place the beets in a large bowl. Add basil. Drizzle with extra virgin olive oil and fresh lemon juice to taste. If you like extra lemon, grate some of the zest before juicing. Add crumbled feta cheese. Mix lightly and taste. Add salt and pepper if desired. Serve room temperature or chilled. I think you can easily enjoy it all yourself! And it keeps several days. Thanks for viewing past posts!